The Sea of Cortez is a narrow gulf bordered to the west by Baja California and to the east by the coastline of northern Mexico. It's famous for its sunshine, sandy beaches and the amazingly bountiful aquatic life. In fact, this is one of the premier fishing destinations in the world. The numerous small communities sprinkled along the shores of both sides are popular travel destinations for American "snowbirds" and their RVs. Drive-up camping sites, both with and without electricity or other utilities, have appeared over the last couple of decades in towns throughout the area to meet this need. A few of the best RV parks/campgrounds in this area are highlighted below. 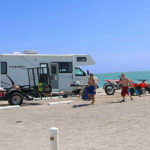 The Reef RV Park at Sandy Beach is a new RV park that offers full-size RV camping sites right on the beach in Puerto Penasco, Mexico. You can walk out of your RV and enjoy swimming, fishing or extended walks along the sandy shore. The Reef o ffers full RV amenities including water and sewer connections, 30- and 50-amp electrical hookups, and a dumping facility. Other services offered are 24-hour security, clean bathrooms with nice showers, a reasonably priced buffet, a store, free wireless Internet and laundry facilities. There are a few other RV parks in Puerto Penasco including Playa de Oro RV Park, Playa Bonita RV Park, and Bonita RV Park. A couple of hundred miles to the south, Loreto, Mexico is nearly two-thirds of the way down the Baja peninsula, and has turned from a sleepy fishing village into a growing resort area in the last few years. Loreto Shores Villas and RV Park is a quality RV park located in Loreto, offering direct access to the beach and all amenities. Loreto Shores RV Park has a huge 5-acre gated RV campground with 24-hour security, and provides Wi-Fi internet, and short- or long-term storage. El Golfo, at the northern tip of the Sea of Cortez and just 60 miles from Yuma Arizona, is another area that has developed into a thriving resort community and offers great fishing, snorkeling, hiking, and even ATV driving if that is your thing. El Golfo RV Resort has direct beach access, and is a full-service resort including a large pool and a cabana restaurant/bar. El Golfo also provides water and electricity hookups as well as dumping facilities for RVs. El Mirador RV Park is located in Playa Hautabampito, Mexico, not far from Los Mochis at the southern tip of the Sea of Cortez on the western coast of Mexico. El Mirador RV Park is a wonderful spot off the beaten track. You can park directly in front of an endless romantic beach with no other travelers around for miles and miles. El Mirador RV Park offers 40 RV hookups and 25 of these have 30-amp electrical connections. A nice palapa-style restaurant that offers fresh and tasty seafood daily is associated with the adjacent hotel. The Hautabampo region is famous for its big game fishing, especially during the late summer. 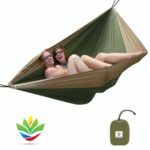 This types of camping hammock is resistant and long lasting. It has a small stretch that makes it more comfortable. 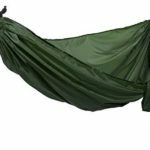 This camping hammock is ideal for sleeping a couple of nights simultaneously. 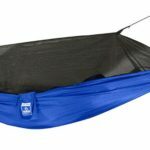 The parachute hammock is available in single and double variants. This one is very light and compact at the same time. It is designed to be used for lightweight and fast hiking trips. Note that, when you cut weight, comfort declines as well. This one is made of very high quality materials to give you the best protection when you are on backpacking expedition. 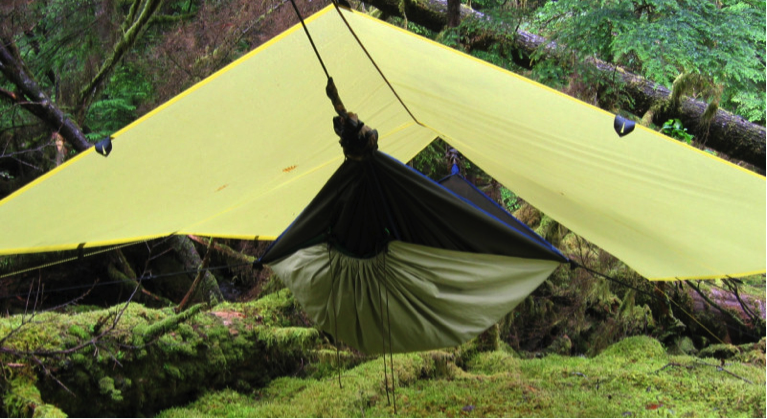 The hammock features various accessories such as a rainfly, extra guy lines and a mosquito net. There are many hammocks on the market, and most of them are made of either nylon or cotton. For the cotton hammocks, they are pretty much attractive, thanks to their weave. But, it is bulky, heavy and attract a lot of water. This makes them dry slow during wet weather. On the other hand, the nylon hammock is the way to go when it comes to camping trips. It is lighter, repels water and less bulky, offering the best performance in harsh weather conditions. The width and length of the hammock are all about personal preferences. If you want to sleep alone, choose a hammock that is bigger enough for one person, and not something that that’ll make you feel claustrophobic. 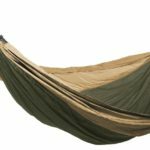 Parachute nylon hammocks are among the most typical kinds of hammocks that are in the market today. The material is identifiable by its crinkly look. 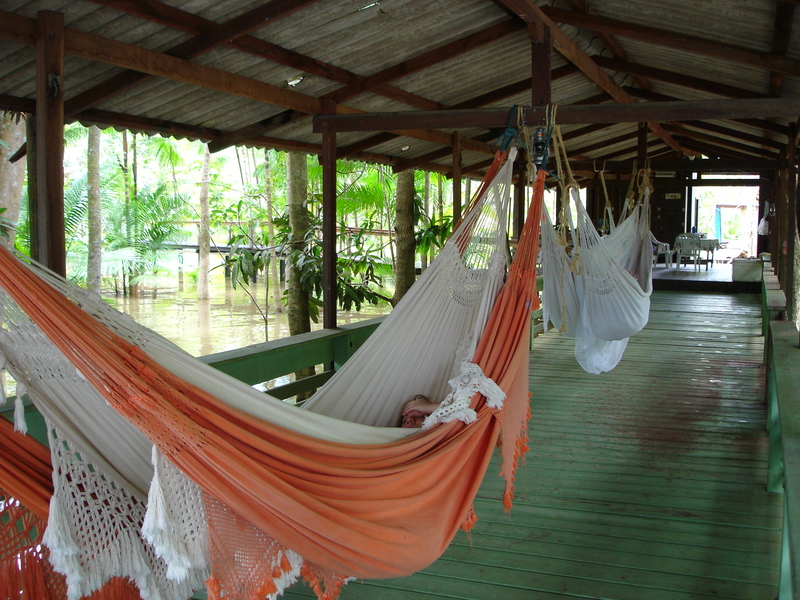 It is among the greatest materials used in making hammocks that can accommodate approximately 181 kg load capability. It has a relatively soft texture. 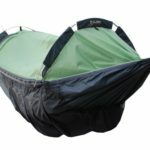 The parachute nylon likewise has a moderate stretch which is chosen by most campers for the very best convenience. These are outstanding for backpackers who are trying to find the lightest options that are available to lower the weight of their bag pack. These models are less comfy and resilient that a regular single. When extended stay in a more comfy unbalanced design, these are models that are big and are developed to stand up to many conditions and. They include functions such as rain flies and bug internet. The bug-net is dark green in color that makes it simple to translucent. They are much heavier and more costly than other open design. Outdoor camping is a custom that is time honored and is delighted in by lots of people even today. You know all about what to bring and how to pick the best outdoor camping fundamentals if you are a regular camper. Since hammock outdoor camping has ended up being the way to go, it is necessary to know which hammock serves best. 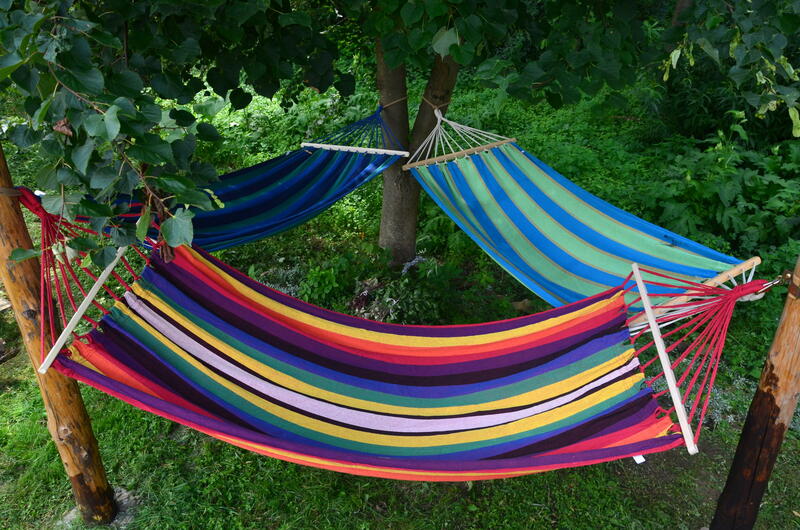 When selecting a hammock, there are a number of aspects to think about. Deciding to go trekking into the hills with a hammock and not a camping tent is challenging. A camper who decides to enter into a winter storm has a totally different set of issues as compared with a camper who opts to trek in the desert. 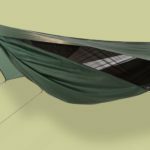 These 2 kinds of hikers will need to think about a lot prior to selecting an outdoor camping hammock. Think about in what type of setting you will be utilizing the hammock. Will you require a bug net or rain fly? Or is oversleeping the open model type simply fine? Figure out whether you will be utilizing yours for sleeping methods or primarily relaxing around the camp. If you are simply beginning, it is a good idea to bring along an ultra-light model for a short backpacking trip as well as bring along a light-weight camping tent or shelter as a back-up plan. 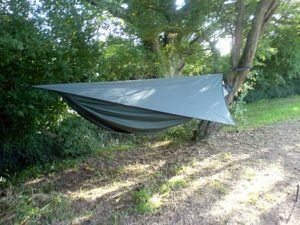 When opting for longer journeys, where the weather condition is unforeseeable or it alters from time to time, fully-rigged hammock variations can be brought along as a replacement for camping tents. This assists in lowering the pack weight and includes adaptability and convenience to the camp established. An outdoor camping hammock is fun and is significantly a more comfy way of taking pleasure in the wilderness. Because models that are uneasy to sleep in are not perfect for outdoor camping, convenience is the best quality. When buying online to see which equipment suites you best, it is crucial to inspect out camping hammock evaluations. 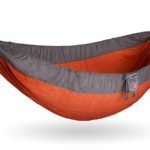 Hammocks that are roomier have the tendency to use much better sleeping conditions while the lighter styles compromise convenience for products that are compact in size however typically affect the quality of sleep. There is likewise the case of high quality, light-weight pads and bags that will couple with the hammock. to think about the suspension system. Some models include a consisted of cable while other do not. Size likewise impacts weight. Some models have slim functions with resilient product. An excellent general rule is that the broader and longer the hammock is the more comfy it will be. The greatest hammocks are those that are made from nylon. The product can secure from wind and light rain. 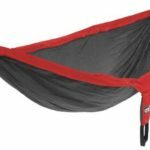 The very best outdoor camping hammock that provides protection from these conditions is the Hennessy exploration asym as it is incredibly weatherproof. It likewise has a bug net. 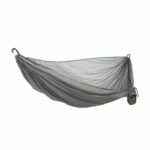 The blackbird likewise has a detachable bug net and a deep flooring to cut the wind from streaming into the hammock. 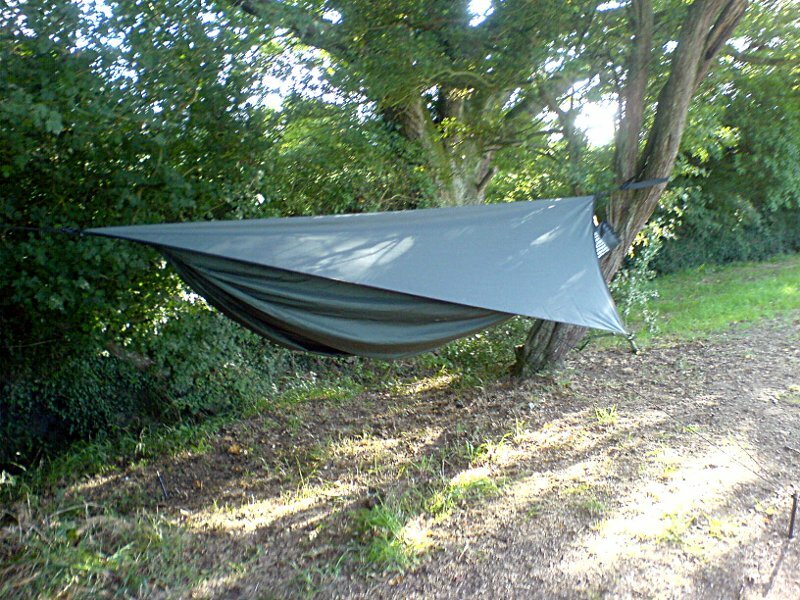 An excellent outdoor camping hammock model need to be flexible to fit the user's needs. An excellent hammock can be used for sleeping, relaxing, sitting, and much more. The doubles are an excellent option for adaptability. 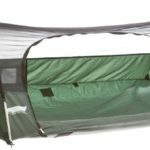 The single parachute models are likewise an excellent blend for those searching for light-weight options for outdoor camping. Setting up can be challenging, particularly if the hammock does not have cables or straps to twist around the anchors. It is recommended to choose models that have Carabiners and extra cables. If you have a more modern-day camping tent it is easy to set up. And the hammock is another basic established. You'll simply need to find some trees situated far enough apart (and ideally not over an enormous canyon) and begin strapping your hammock up. Yes, the very first time or more that you assemble it, you may have a question to make sure that whatever is going properly. Then once again, you need to most likely be doing a dry run of any new equipment prior to taking it out on the path to ensure that you know how to use it correctly and to care for it properly. A bug net is one the crucial accessories to offer the camper with a bug-free sleeping space. Remaining warm is likewise a concern since the wind blows from under the hammock. One way to fix this is by sleeping on a basic sleeping pad at the bottom. The under-quilt boosts heat and convenience. With walls all around you, even if they are thin camping tent product there is a frame of mind that makes you feel much better. While you might have a tarp up over your hammock and it might do a much better job than a camping tent at keeping all the rain off of you (in some way camping tents always appear to have that one place that rain storms appear to find to let water in). When the wind kicks up you are still swinging in a cocoon in between 2 trees. A mild breeze and a soft rocking may assist your wandering off to sleep with the sound of the woods, however, a true storm can have you swinging to the point that you are questioning if you can get seasick in a hammock. It is crucial to carry out a coat comparison prior to buying an outdoor camping hammock. Camping products differ in cost depending upon their quality and the place of sale. When planning to conserve money the very best place to buy is online since there are different sites that sell excellent and inexpensive quality equipment. When buying online, rate comparison is likewise really simple. In the end, it is everything about what you require and can pay for. Consider who or how many people will use the hammock. Will 2 or more people use the hammock at a time? Once, make sure to buy a strong stand with the weight capability to hold all users at. Always remember while you and/or your loved ones are lying suspended in mid-air that your hammock is just as safe as the tree, post or stand that supports it. Depending upon what hammock you have and what accessories you have brought with you, you might get up with some unwanted presents from the trees. Some hammocks have an integrated bug screen, others are simply open top. Some people find sleeping in the traditional hammock "banana shape" to not be the way that they desire to spend their nights.